Starfish appear graceful as they move around the ocean floor and coral reefs, but they are predators. Their main prey is shelled animals such as mussels and oysters, but they also eat smaller starfish. They aren't their own worst predators, though; large fish, sharks and manta rays commonly dine on starfish, but starfish have a few tricks to escape. 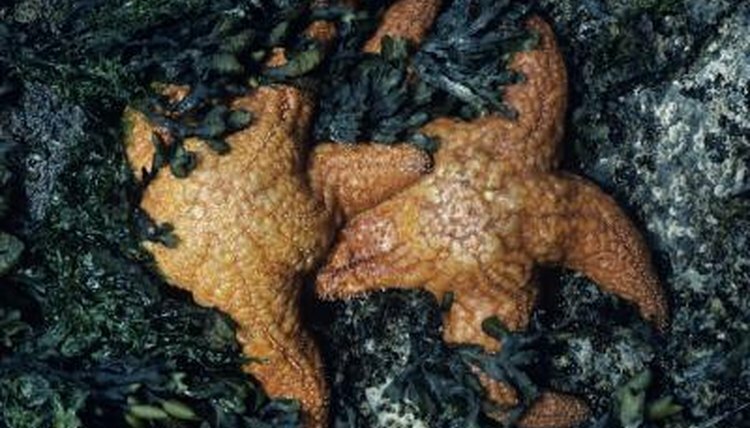 A starfish moves by pushing water into and out of tiny tube feet, which cover the bottoms of the creature's appendages. The tube feet move with a rippling effect, pushing the starfish's body forward. Although the starfish isn't faster than predators such as sharks, he can move quickly enough to get away from slow-moving predators such as other starfish. If a starfish is close to shelter such as rocks or a reef, he can often get close enough to make it more difficult for sharks and rays, who are too large to navigate many small crevices, to make a meal out of him. Some starfish are experts at digging into the sand, helping them hide from the watchful eyes of predators. Sand-sifting starfish, for example, flip up the sand to seek prey, but they also burrow and toss sand over their bodies when feeling the stress of nearby predators. Like running away, burrowing doesn't happen in an instant, but it gives the starfish a better chance of escape than remaining on top of the sand. As an echinoderm, a starfish has amazing powers of regeneration. One of his best defenses against predators is his ability to drop off an arm that's grasped in a predator's mouth. Assuming the predator doesn't bite off the arm, the starfish can intentionally separate it from his body to aid his escape. The predator might get a small starfish snack, but the starfish can regenerate an arm to replace the lost one. Many starfish can regenerate if bitten in half, and some can regenerate from a single arm -- if a predator eats all but one arm, the starfish still survives. Because they can't outrun most of their predators, starfish have developed other ways of discouraging predation. Most have hard, spiky skin that's unpleasant to try to eat. Many starfish use camouflage as well, with their skin reflecting the colors of their favorite habitats. Brightly colored starfish often frequent coral reefs, which are awash with color. Other starfish sport more neutral, mottled tones to help them blend in with the sand on the ocean floor.